The JBL Flip 3 Bluetooth speaker is on sale at a discounted price of 6,299 and the BenQ MS527P 3D DLP Projector is being offered with a cashback of Rs 2,779. 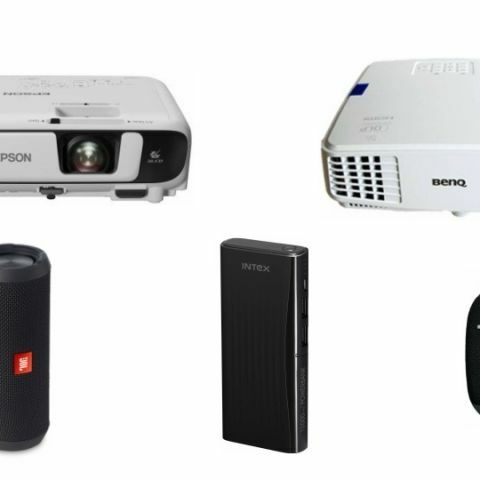 If you are on the lookout for a projector to set-up for personal or professional use, we have listed some decent products which are currently on sale at a discounted price. There’s also an assortment of other gizmos. The BenQ MS 506-P DLP projector features an 800 x 600 resolution and boasts of up to 10,000 hours of bulb usage life. It comes with a SmartEco power Saving technology and has a max brightness of 3200 Lumens. The BenQ MS527P 3D DLP Projector has a maximum projection distance of 25ft and claims of 4000 hours of lamp life. The SVGA type projector features an 800X600p resolution and sports maximum brightness of 3000 lumens. The Epson SVGA projector has a maximum projection distance of 16.7mm and a lamp life of 10000 hours. It also has an 800X600p resolution and has 10 bits colour processing support. The 13000mAh by Intex is up for sale with 47% off on MRP. It comes with two USB out ports and an output power supply of 5V/2.1A and 5V/1A. It promises of 500 charging cycles. The Bluetooth enabled splashproof speaker by JBL is up for sale at a discounted price of 6,299, down from Rs 9,990. It has an impedance rating of 4 Ohms and frequency response between 85hz-20khz. The UE Wonderboom is up for sale with 33% percent discount and is down to Rs 5,299 from its previously listed price of Rs 7,995. The speaker features an 86W power output, supports Bluetooth and has a frequency response between 80 - 20000 Hz. The Logitech K230 wireless keyboard is available for Rs 649 after receiving a 35 percent discount on MRP. It comes with a USB wireless dongle and works on the 2.4GHz channel. The McAfee Mobile Security is on sale and is available for Rs 55 after a considerable discount. It is a 1 Device, 1 Year product key, which will be emailed to the customer. It works for IP addresses assigned only for India and is said to detect and removes viruses, Trojans, malware and more. It also comes with a tracking feature.